Fantasy Flight Games has announced the Q3 release of Android: Netrunner, an updated Living Card Game version of the classic Netrunner card game, which was designed by Richard Garfield (Magic: The Gathering) and originally published in 1996. Described as the “one of the greatest customizable card games of its era,” Netrunner has returned as Android: Netrunner, an asymmetrical Living Card Game for two players, one of whom plays the role of the leader of a powerful corporation while the other is a lone netrunner. 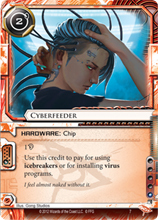 Android: Netrunner is set in a cyberpunk future and pits a megacorporation with its massive resources against the subversive talents of lone runners. Players who take the role of the corporation try to score points by advancing their agendas, while netrunners try to score points by breaking through the corporation’s defenses and stealing valuable data. The 252-card Android: Netrunner (MSRP $39.95) card game comes in a single box and like all the Living Card Games includes everything needed to play the game. The asymmetrical game resurrects the mechanics of the original Netrunner, designed by Richard Garfield, and updates them to increase clarity and promote a more dynamic play environment.